Save on your BBQ Wood Chips at Foreman’s General Store in November. Buy 5 bags get 1 FREE November 1-30, 2018. 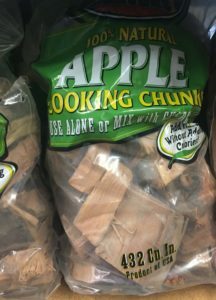 Barbeque Wood Flavor Cooking Chunks help backyard grillers add a delicious wood smoked flavor smell to anything they put on top of the grill. Used with charcoal, the Cooking Chunks add real wood smoke flavor to your dishes. Used alone, the chunks provide you with a fire ready to cook over in 18-20 minutes and burns cleaner than charcoal with much less ash left when you are finished. Barbeque Wood Flavor are 100% and add flavor without adding calories. Offered in a variety of wood choices so you can try a new flavor every night or mix woods for a unique blend of flavors. This entry was posted on Thursday, October 25th, 2018 at 12:12 am	and is filed under Grilling, News & Updates. You can follow any responses to this entry through the RSS 2.0 feed. Both comments and pings are currently closed.